Dr. Kamal came to us in a panic. 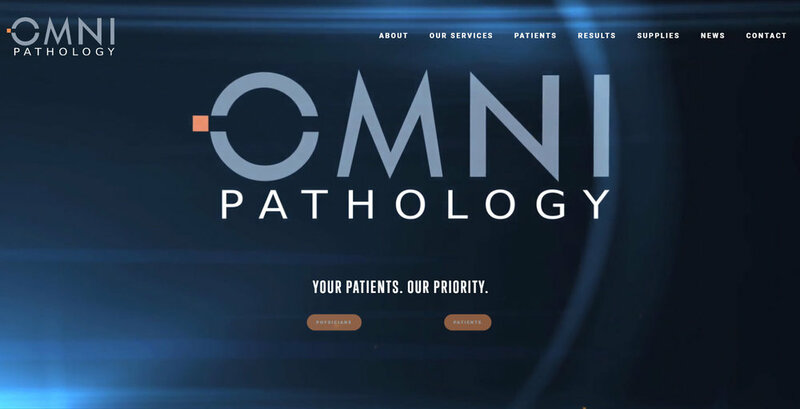 a brand new website for his company, OmniPathology. the website was still not even close to being finished. We were upset to hear that these other so-called "web designers"
were dragging their feet on his website. There is NO excuse. Just bad! and asked us what we could do. and it was just a simple Wordpress template that lacked personality. The copious use of canned stock photos was lazy. he would have an entirely new site - DONE THE RIGHT WAY! He was skeptical -- "Two weeks?!" he gasped. made it into a meal he will never forget. he and his employees were in awe of the final results. We create visually stunning page headers branded with realistic logo use. This is a screen shot of the homepage the other "web designers" created for OmniPathology. The use of two-tiered navigation is clunky and out-dated. The stock photograph of the microscope up-close shows no personality, nor truly reflects OmniPathology. "Home" as an option in the navigation bar is a waste of space. "Welcome" on the homepage is impersonable. This is a website... NOT a doormat. Icons at the bottom for "Physicians", "Patients" and "Contact" are not only outdated... but they don't even match what they are for. For example - a book icon for "Physicians"? Wouldn't a stethoscope icon be better? Then the icon they used for "Patients" is a magnifying glass - which is usually indicative of a "search" function. This is an example of poor quality work! Also, why do they explain under the icons with text what "Physicians", "Patients" and "Contact" are for. Do they think the visitors to the website are dumb? What a waste of space. 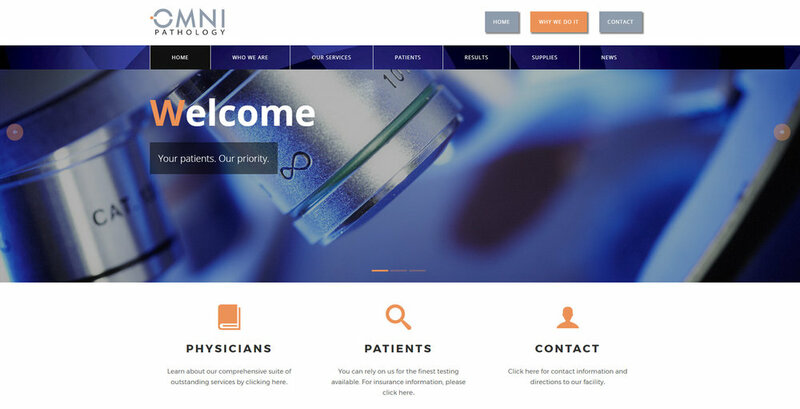 This is a screen shot of the homepage we designed for OmniPathology. As soon as the visitor lands on the homepage they are met with a fullscreen video that opens with the OmniPathology logo big, bold and pronounced on the page... essentially saying "you have arrived"! 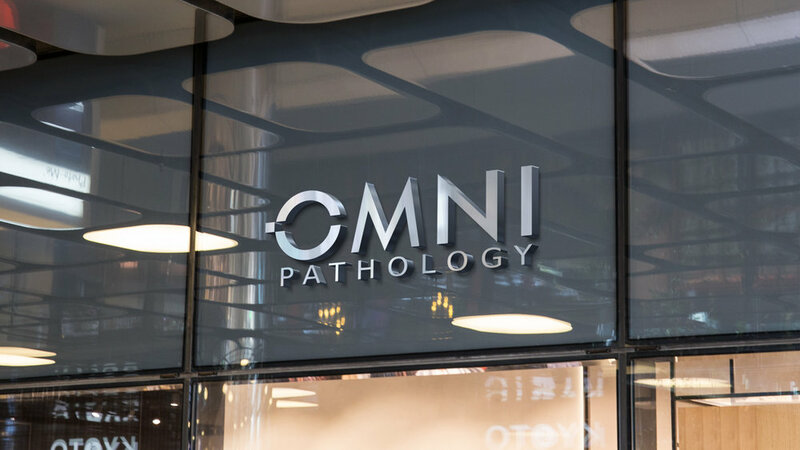 The fullscreen video quickly dives in and out of images of cells under the microscope - mixed with video footage of actual OmniPathology staff working - then interwoven with the OmniPathology logo animated with motion graphics. Visually interesting! Top navigation streamlined to 7 options, rather than 10. The slogan "Your Patients. Our Priority." remains bold and present while the video plays in the background. Seeing the staff working hard in the video while keeping the slogan visible cements brand identity! Two buttons at the bottom are clear and easy for the visitor to choose where they need to go. Simply "Physicians" and "Patients". No clutter!